Splurge Or Save… On Leopard Print Flats? I recently had a very insightful discussion on the preferences of animal print, how to wear it & what the essentials are for one’s wardrobe (yes, this really happened). Of course I’m crazy for zebra (with a purse, flats, sheets, laundry bin, skirt, etc…), however leopard print just won’t go away, & why should it? I own a satin pair of ballerina flats with a fabulous leopard print & bow-crystal accent at the heel. They’re super comfortable & perfect for any casual look or fashionable dinner with the girls. In my newest category (yes, the creativity just keeps pouring out- see Fabulous in 4 Ways), Splurge or Save? will investigate an item at different price points. Staples like leopard print flats can be found virtually anywhere, especially this time of year when we’re preparing our fall wardrobes for chic splashes of personality when the weather becomes crisper. As you can see, we have a little celebrity inspiration joining us. Fashion icon Alexa Chung wears her pointed toe leopard flats with a menswear-inspired shirtdress, reinforcing why she’s just so darn fun to watch. Designer Whitney Port looks sweet mixing prints in her Whitney Eve outfit & leopard flats. Socialite Olivia Palermo, who’s been everywhere lately it seems, breaks out in a feminine floral shorts look & some bowed leopard flats. 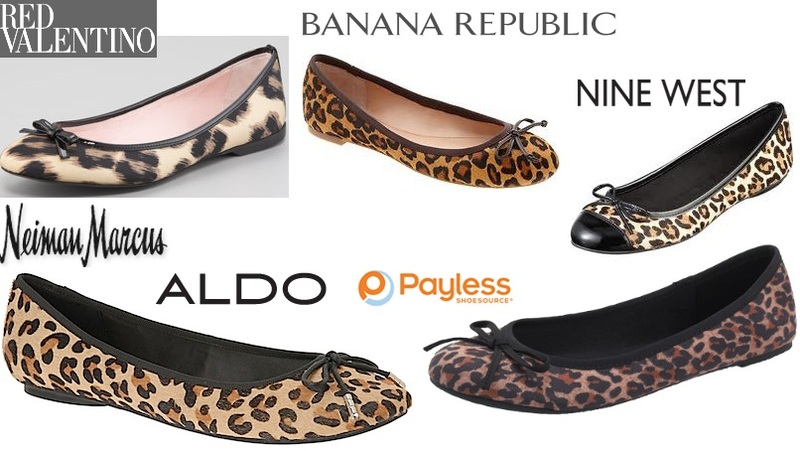 However, now that we’ve seen some of Style Darling‘s favorite celebrities wearing leopard print flats, let’s take a look at what I’ve found, ranging in price from $14.99 – $275.00! The above five shoes range quite a bit in price, but each share the same concept of a bow detail & black trim around the foot, which emphasize the classic design of a ballet flat. First, the RED Valentino leopard print ballerina flat ($275.00) from Neiman Marcus would cost you just over $10/wear if you wore them once every other week. Perhaps this doesn’t sound so bad, but dropping the cash to buy them initially will put a big dent in any shopper’s budget. I’d feel lucky to the proud owner of any Valentino piece, but at this point in my life, such luxuries will only appear on Super Style Wishlist. Next, the Ashley bow ballet flat ($98.00) from Banana Republic will earn you plenty of rewards points for future discounts if you’re a cardholder, but the fact that this style of ballet flat is available in other such trendy textures like tweed, patent leather, croc, houndstooth, metallic, & suede will certainly suit your shopping fancies. While clicking around @Nine West, I discovered the Cacey flats ($79.00), which serve double purpose with the patent leather cap toe accenting the wild print. However, the cost-per-wear for these is down to $3/wear, if worn once every other week. NOTE: Select designs of this shoe (polka dots & pink colorblock leather) are currently reduced to $29.00 on the website! Moving on… I was pleasantly surprised to find that ALDO‘s clearance section included the Warnack flats ($35.00) which have been reduced from their original $70.00 price tag. The metal tips on the bow add some extra detail to what surely will be an already polished look. Lastly, the most affordable pair in our collection includes the American Eagle Flash flat ($14.99) @Payless– my go-to source for shoes. I know I can always rely on Payless for comfortable, yet stylish shoes that work with my budget, especially when I’m on the go & can’t always take the time to go shopping in a store. When ordering online, Payless offers FREE SHIPPING if your purchase is shipped to a store location, which always makes me happy. Since these are the least expensive of all of the selections, I’d like to inform readers that the CPW (again, cost-per-wear) now becomes less than .60/wear. If you plan on wearing them more than once every other week- & I don’t blame you b/c they’re just so cute!- you’re still getting a bargain for a reliable must-have when building an outfit. How much would you spend on a pair of leopard flats? This sort of investment will keep paying your back, since these versatile statements of footwear can go with you to the office, school, on a date, or wherever your day may lead you. I know I’m a sucker for a good deal, but when it comes to shoes, there are a few other factors to consider like fit, how well the texture is made, if I like the print, & so on. What about you? What would you do? Would you splurge or save? Happy Styling! This entry was posted in Basics for a Bargain, Luxury Look-Alikes For Less, Quickie Darling Deal & Steal, Red Carpet Review, Show Me The Shoes, Splurge or Save?, Style Darling Daily and tagged ALDO shoes, Alexa Chung, American Eagle, ballet flats, Banana Republis, leopard print flats, Neiman Marcus, Nine West, Olivia Palermo, Payless, RED Valentino, splurge, Whitney Eve, Whitney Port. Bookmark the permalink. ← The Stylish Five: Charlotte Russe’s Summer Farewell Sale ($15 & Under)!